Does the carpet on your stairs just plain need to be replaced? 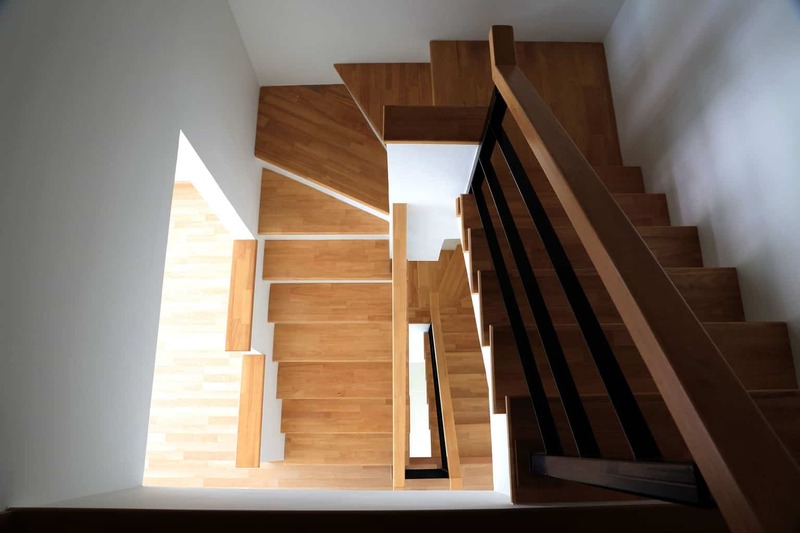 If you've just bought your home, you may want to make some minor changes like replacing that ugly carpet on your stairs. Even people who have lived in their homes for a while may notice that the carpet needs to be replaced and that means it's time for a change. We've talked to many people who want to know what options they have besides carpet; laminate flooring on stairs tends to be popular and one of the best choices available once we've gone over all of the options. 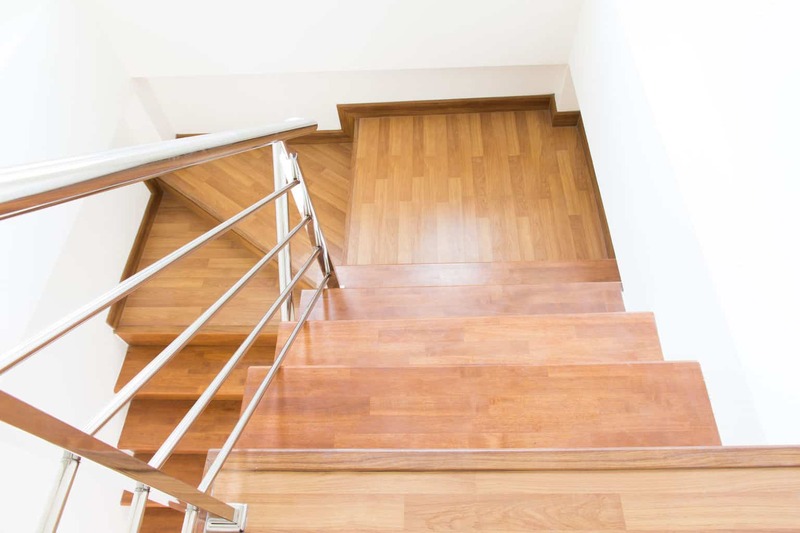 Is laminate flooring for stairs right for you? One of the major complaints of carpeted stairs is that the vacuum cleaner just doesn't seem to be cutting it. It's easy for mud and stains to work their way down into the carpet, especially if it's installed in a high traffic area like your staircase. 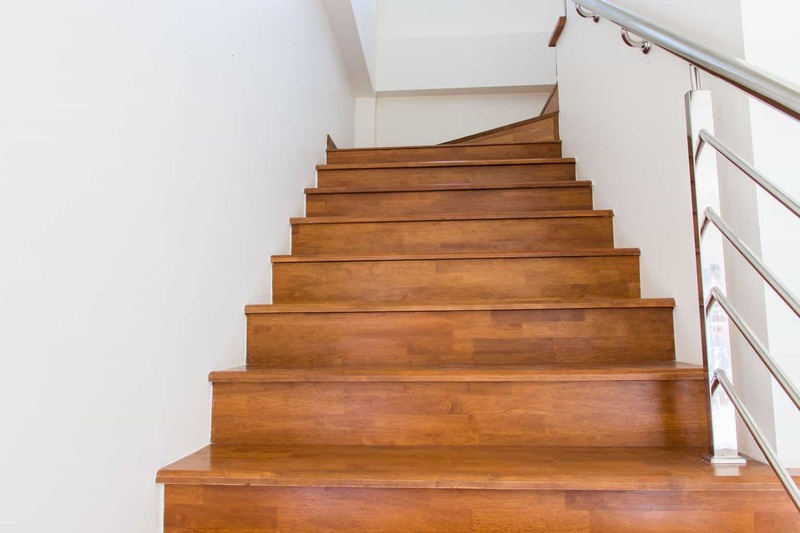 When properly installed, laminate flooring for stairs doesn't have this issue because it's easier to use a damp rag on areas that have are muddy or have been spilled on. People are stomping up and down your stairs all day long and you might even have a large breed of dog that goes up and down the stairs, digging its sharp claws into them. Quality laminate flooring can usually hold up to the damage pretty well. If a piece of laminate becomes damaged, it's usually pretty easy to repair or replace it. It'll probably be years before that happens, though, so there's no shame in taking the pieces of the broken laminate to a home improvement store to see if they can find a match. 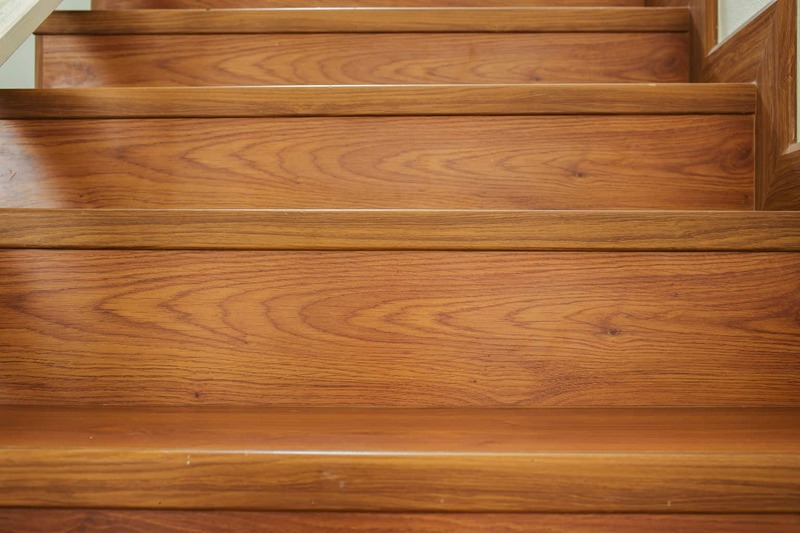 You're getting the look of quality hardwood with very little of the work involved in cutting hardwood boards down to size so that they can be installed in staircases. The ease of installation makes laminate flooring popular with people who have experience with DIY flooring installation projects. However, if you choose to hire a professional, the installation usually won't take him very long at all. The quality of laminate has improved in recent years, so you can get the look of exotic hardwoods without having to pay a high price for them. The best quality laminate usually doesn't cost more than $7 per square foot and you can get it for less in most cases. When installed appropriately, laminate flooring is practically indistinguishable from real wood planks if you don't look too closely. It's a printed image, but it's one that has improved in quality so that it actually resembles the natural wood that inspired it. That means the laminate can fit in well with the overall effect you want for your staircase. One thing to keep in mind when installing laminate, though, is that laminate of any color is usually limited to five or six printed patterns. If you install it yourself, you'll want to make sure you aren't putting two pieces with the same pattern next to one another. Are there any downsides to laminate staircases? Not very many, except in cases where you might have very small children who might spill drinks on the way up the stairs or you just got a puppy who hasn't been housebroken yet. In that case, you'll just have to remember to clean up accidents as soon as possible to avoid possible water damage to the stairs. Also be sure to occasionally inspect the laminate for any signs that the image is beginning to peel or the laminate is becoming discolored or warped. This might be a sign of hidden water damage that will have to be addressed before it gets worse. Standing liquids on the floor and high atmospheric humidity levels are the top causes of damage to a laminate floor, so if you can keep those two factors under control, your laminate floor will last that much longer. 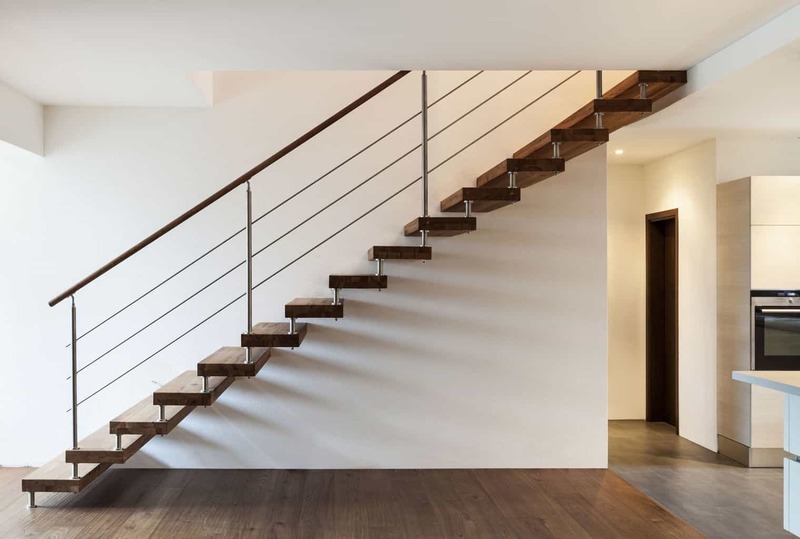 It can be in cases where you want to replace the existing flooring in your staircase with a new flooring option that's easy to take care of and can look good for years. It gives you the same good look of natural wood without having to pay the high price of some natural woods. Just make sure you don't make the common mistake of allowing spilled liquids to stand on it for a long period of time. Do people have problems with the stair nose falling off when vinyl planking is used in on stairs?